We grew from five to thirty women, who met on a regular basis to learn. We also organized luncheons and dinners for women from various walks of life. Throughout this time, the Rebbe provided constant support and encouragement and became effectively our program chairman. Meanwhile, my husband started classes for college students at the Hillel House at the University of Cincinnati, while I learned with the girls in their dormitory. As well, my husband was invited to teach the Talmud by the students of Hebrew Union College, the Reform rabbinical school. When my husband asked if he should do this, the Rebbe replied that he should, but that “the students should come to you.” Indeed, they came to our apartment regularly for the next ten years. After a time – this was in the summer of 1956 – I went to New York on my own to visit my parents and took the opportunity to have an audience with the Rebbe. Upon walking into the room, he asked me in Yiddish, “Why are you so pale?” I was shocked, because I thought I looked so good in the new clothes I had just bought for the occasion! I really didn’t know what to answer, but I told the Rebbe that I was newly pregnant and this may be why I was looking pale. The Rebbe asked me if I had household help. I didn’t, as we couldn’t afford it. Nonetheless, the Rebbe said that we should hire someone. I realized then that, in order to fulfill all the responsibilities of a communal leader, I really did need help. But most of all, I was impressed with the Rebbe’s extraordinary sensitivity to the individual needs of his emissaries. After ten years in Cincinnati, we felt that we had sufficiently fulfilled our mission there, and we decided to ask the Rebbe if we could leave. We were concerned about our aging parents who lived in New York, but even more so about our children’s spiritual welfare. The Rebbe then asked us, “Are you renting, or do you own your home?” Of course, we were renting. “It is time to buy a home,” the Rebbe advised, adding that owning a home is a good thing because its value is likely to increase over time. As I recall, he said it would be worth four times as much when we will decide to sell it in the future. Indeed, when the house we bought at that time was sold many years later, the selling price was, almost to the dollar, four times what we had paid for it. Four years after we purchased our home, my husband was appointed the presiding rabbi of the Vaad Hoier of Cincinnati, a position he held for the rest of his life. It became clear to us that the Rebbe, when telling us to stay in Cincinnati, was planning for the future. On another occasion, the Rebbe gave me very wise advice concerning Jewish education. I had been invited to observe a Montessori classroom and, seeing how actively involved the children were in their learning, I realized that this method could be a major asset in Jewish education. So I developed a program which appealed to other teachers. But I was a little bit concerned about some of the education perspectives of Montessori theory, and – to make sure I was on the right path – I consulted the Rebbe. He urged me not to become involved in the “philosophy” of Montessori. I took that to mean that I could use the Montessori method as an aid to teaching Torah values, but that I should not let the method itself become the focal point. Upon the Rebbe’s advice, I advertised my program as “Individualized Instruction Using Montessori Materials and Methods,” and I have used this program in my teaching for over forty years. During another audience, the Rebbe asked if we had a day camp in Cincinnati. When we replied that we didn’t, the Rebbe looked at us and said in Yiddish, “The influence of a Jewish day camp can leave a longer-lasting impression on the life of a child than any other events that take place during the whole school year.” Though it was one day before school term ended, as soon as we returned home, we started a summer camp. That is how, overnight, Camp U’faratzta was founded. Another time, many years later, my daughter Esty, who was a teenager, was going to switch schools. The Rebbe advised me to make sure that she had friends when she started this new school. She was a very social kid and she needed friends in order to feel included and succeed. That he knew this about her and cared about this one young girl out there in the world, was just astounding. So, after that, I reported everything, and the Rebbe would often comment on or correct various things that I sent him. When we were hosting the Chabad Women’s Organization’s mid-winter convention in 1980, I sent the invitation to the Rebbe before it was printed. And he instructed me to change “Friday evening meal,” to “Shabbat evening meal.” No matter how seemingly trivial, nothing went unnoticed by him. In this way, the Rebbe was constantly teaching me, as he taught all his emissaries, that every small act matters – that even though it may feel only like a drop in the bucket, the bucket is constantly being filled. His individual insight, caring and guidance will always amaze me and, when I think back on it, I am humbled. 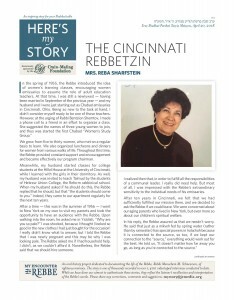 Mrs. Reba Sharfstein and her late husband, Rabbi Zelig Sharfstein, served the Cincinnati Jewish community for over 50 years. She was interviewed in January 2009.